Having been an integral part of the successful Parade CBC football team, John Benetti fancied himself as a VFL footballer. His cousin, Sergio Silvagni was also a dominant player in that same school team. After much convincing from John, Serge thought he might also make it at the top level, so together they decided to approach the Carlton Football Club for a game. Both impressed in their first "walk off the street" session and were quickly assigned to train with the club. While Serge trained with the under 19s, John was sent to the Reserves. Unfortunately, after John played one Reserve game in 1955 he was called back to play for Parade (school rules) and was therefore not permitted to play any further Carlton games for that year. He did his apprenticeship in the Reserves during 1956 and 1957, playing some exciting football for which he scored many "best" mentions from sporting journalists. However, his progress was interrupted by foot trouble, culminating in both the removal of a right foot toe nail and the top of one toe of the left foot, costing him many games in his second year. He made his senior debut in 1958 and went on to play 88 games in the number 8 guernsey. Nicknamed “Tank” by supporters because of his 177 cm, 80 kg physique and his fearless, straight ahead style of play, Benetti was a crowd favourite. "He thrilled with his relentless pursuit of the ball, a brilliant flying mark and a speedy clearing dash." 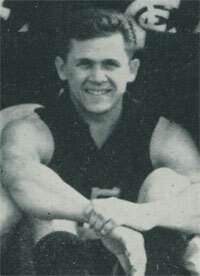 was how Damon Mills described him in his article in Sports Novels (August 1958) titled "Benetti is Carlton's atom bomb of the half-back flank". He also acknowledged that few footballers would be written up as a new sensation after only 12 games in the big league and he acclaimed that John Benetti was one of the best first-year players the VFL had ever seen. 12 votes in the Brownlow count supported his terrific introduction to League football. "Troubles" became his nickname after complaining strongly to the late Jack Wrout a few times about being dropped. Jack Wrout, a former great player and by then an administrator, responded with “Troubles, you’ve always got troubles. Troubles, troubles that’s your name." John played on the last line of defence in Carlton’s 1962 Grand Final team beaten by Essendon and was listed as one of the better contributors during that finals series. In his rare ventures forward, he kicked 15 career goals. Benetti coached VAFA A Grade team Ivanhoe in the 1972 and 1973 seasons. One little known fact about John is that he built the old scoreboard (since demolished for the Legends Stand). Benetti also played with Carlton Stars prior to his journey to Carlton. Benetti also wore No.6 in 1956 and No. 35 in 1957 whilst playing some reserve grade football for Carlton. John Benetti had "John Nicholls like thighs," they were massive for a player of his size. "Heading for a fall is St. Kilda's Carl Ditterich, who is "helped" through the air by Carlton's John Benetti at Carlton on Saturday. Carlton defeated St.Kilda by Two points." Contributors to this page: Grisdesa , blueycarlton , WillowBlue , pblue , Bombasheldon , Jarusa , molsey , tmd1 , Marianne , p(12)terg , kingkerna , PatsFitztrick , true_blue24 and admin . Page last modified on Thursday 26 of July, 2018 23:29:41 AEST by Grisdesa. 1996 - Legends Game: Peter 'Buzz' Bosustow. 1974 - 200 Club: Perce Bentley.